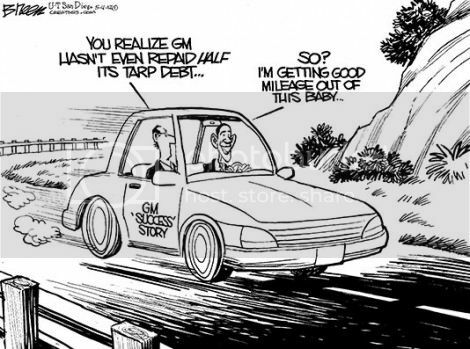 Taxpayers only lost $19 Billion by bailing out GM and Chrysler. I was reading through Automotive News and noticed a story in their "Final Assembly" section indicating the U.S. Taxpayers will likely lose $19 Billion by bailing out GM and Chrysler. To be clear, I supported the decision to bailout GM and Chrysler in 2009 and I still support the decision today. That said, I bet the collective brain-trust here at DealershipForum could have completed the task for a lot less than $19 Billion. I also think it's ironic that the solution implemented by the Task Force resulted in Chrysler being owned by an Italian company, Chrysler Financial being owned by a Canadian company and allowed Cerberus to unwind their Chrysler investment almost unscathed. This 19B should be paid back in full from company earnings. The sacrifice should be shared by those that share in the profits & that includes the union-trusts that were gifted stock. The taxpayer is already on the hook for enough. The F-Gvt’s revenue in March was 171.2B, they spent 369.4B for a 198.2B deficit. Every time these idiots borrow more $ they print more $. That’s why a $1 is worth about 18 cents. Compare the price of oil to the price gold & oil hasn’t gone up a dime. Its a little scary when 19 Billion is the INTEREST on the national debt for a month and thats a positive spin! The only way RATner is the smartest guy in the room is if he is the ONLY one in the room and even then its questionable! Seems a little light on the numbers in my opinion, I wonder if that includes the pre-bailout bailout that George W. gave them. Great comments - I agree 100%. The screwing of the taxpayers is even worse when you figure the NEWCO version of GM gets to use the OLDCO version's losses to offset future tax obligations. As I recall, that decision was inconsistent with bankruptcy law and will cost the taxpayers $5+ Billion. You'd think our government leaders would be smart enough to see what's happening in Greece, Italy and Spain and figure out that the deficit spending must stop. I'm pretty sure the $19 Billion includes the funding provided while Bush was in office. The article also mentioned the $19 Billion includes the loss the taxpayers will likely take when selling the government's interest in GM and Ally but it doesn't specify when the govt plans to sell their shares or what share price was used to calculate the losses. Call me a conspiracy theorist, but my bet is the Treasury will split-up Ally and bankrupt the ResCap unit and then sell the automotive operations to GM in a sweet-heart deal. GM's newfound equity in Ally will allow them to buy-out the Treasury and all of this will happen before the elections in November. GM and Chrysler should pay back every penny borrowed. They mismanaged teir business and the should pay back the loans in full. Fiat got a gift the did not deserve and should pay back what the american taxpayer put in. If you divided the $19 Billion lost on the bailouts by the 9,400 dealers that existed before the bailouts it equates to a little more than $2 Million per dealership. As before, I supported the concept of bailing out GM and Chrysler but did it really need to cost the taxpayers $19 Billion? Fiat was just one entity that got a gift they didn't deserve. Don't forget that under U.S. Federal Bankruptcy Code, the Bondholders of any corporation have FIRST LIEN status on ALL assets of the company in the event of bankruptcy. Chrysler's bondholders had 27.2 billion $$ in bonds that should have been satisifed before anyone else got to touch a dime. In the government's 2009 new "we make the rules" version, they said that the UAW would receive 50% of the stock in Newco, Fiat would get 25%, the federal govt. which had put in 7 billion $$ in bailout funds would get 14%, and the bondholders...who had the only legal claim to everything...would get 11%...and it was a "take it or leave it" deal. If they refused to go along, they were told their claim would be ruled by the bankruptcy judge to apply only to Oldco assets, which was left with nothing of value. Summary: UAW puts up nothing and gets 50%, Fiat put up nothing and gets 25%, US govt. (via the taxpayers)put up 7 billion and get 14%, the legitimate lien holders put up 27.2billion $$ and get 11%. I think the odds of the taxpayers ever getting back the actual money owed are ZERO. Again with the passage of time and no interest in checking the detail at this moment, I believe that the 19 billion figure is low and has not included everything. I just heard this weekend that the tax breaks to GM could be as high as 45 billion. The government lent Fiat money to payoff the bailout money at a lower rate and it looks good for the president in an election year. I certainly think the figure is low and the taxpayer has not seen the end to this debacle. Summary: UAW puts up nothing and gets 50%, Fiat put up nothing and gets 25%, US govt. (via the taxpayers)put up 7 billion and get 14%, the legitimate lien holders put up 27.2billion $$ and get 11%. I think the odds of the taxpayers ever getting back the actual money owed are ZERO. Great comments - you're 100% correct. I've read that over 200 years of Bankruptcy Law was pitched into the dumpster when the Task Force screwed the bond holders out of their first lien status. I've also read that the academic-types who study the Constitution and Bankruptcy Law knew the actions of the Task Force were improper but events were happening too fast for them to formulate their objection. In many ways I've concluded the GM and Chrysler bankruptcies were like a pre-scripted play where the Task Force already selected the winners and losers and everything else was just "theater" to distract the masses. Great comments - I wouldn't be surprised if the $19 Billion loss figure is low too. Concerning the loan Chrysler received so they could pay off the TARP loan, I'm pretty sure that deal fell through. As I recall Chrysler couldn't find any financing on Wall Street until it appeared they'd receive several Billion from the Department of Energy. Wall Street issued the bonds and Chrysler paid off the TARP loans but the money from the DOE never came - Chrysler withdrew their request. I've often wondered what the secondary market is for those Chrysler bonds. To the extent that Fiat now owns Chrysler and Fiat's expected to lose money in Europe for the next two years, I doubt there's too much demand to own a low interest rate Chrysler bond. A series of Treasury Department rulings since 2008 let GM use $18 billion in losses — from the "old GM" that was left behind in bankruptcy — to offset any profits. GM had credits totaling $16 billion at the end of 2011, which means it can offset about $48 billion in future income. So, if you add the $18 Billion tax reduction to the $19 Billion that's already been lost it adds up to $37 Billion. Oh, and don't forget that Chrysler is owned by an Italian company that doesn't pay U.S. Income Taxes and Chrysler Financial was sold off to a Canadian company. But the UAW's happy and Rattner's still convinced he's the smartest guy in the room. Lakeshow - That was awesome - my first smile of the morning.